Fig. 1: Schematic diagram of the experimental setup for injection locking of a semiconductor laser. Click on the image for a larger view. Fig. 2: Evolution of the slave power spectrum as a function of the master-slave detuning. Master power is 4 mW and slave current is 45 mA. Fig. 3: Excitable pulses observed in the slave laser time series; single pulses for low master powers and detuning, double pulses at higher master powers and detuning. The synchronisation of two oscillators has been widely studied since the observations of Huygens in 1600, who noticed that two wall clocks of different natural frequencies synchronised when attached to the same wall. In a similar fashion, when the light from a semiconductor laser (the master laser), is injected into a second laser (the slave laser), the emission frequency of the slave may synchronise with that of the master. Injection locking a semiconductor laser has been shown to lead to a reduction in the relative intensity noise, spectral narrowing, as well as a significant enhancement of the modulation bandwidth. Additionally, the possibility of excitability in injection locked semiconductor lasers has been predicted by Wieczorek et al. . A dynamical system is called excitable if it produces a large nonlinear response to a small but sufficiently large perturbation from its steady state. Perturbations of the steady state above a threshold cause a large excursion in phase space leading to a large amplitude pulse. This excursion is followed by a refractory period of time before another can be induced. The CAPPA group conducts an on-going analysis of the dynamical properties of Quantum Dot (QD) lasers under the influence of external injection, and have demonstrated that such a system is excitable. In the experimental setup shown in Fig. 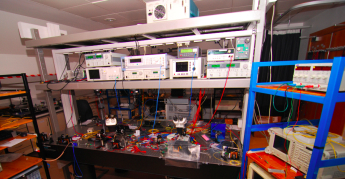 1, the slave laser is a QD laser consisting of 6 InAs QD layers, embedded in an InGaAs quantum well on a GaAs substrate. The slave is biased above threshold and the tuneable master laser is set to a wavelength close to a Fabry-Perot mode of the slave, at a fixed master power. It is then varied across resonance with the slave laser. The master laser is a narrow linewidth (100 kHz) commercial tuneable source, with a wavelength of approximately 1320 nm. Fig. 2 gives a typical example of how the slave laser behaves as the detuning is varied, for particular fixed values of the master and slave power. Three distinct regions of behaviour are evident: (i) in regions far from zero for both positive and negative detuning, a beating frequency indicates that the slave laser is unlocked from the master laser; (ii) a stable locking region, where the slave laser synchronizes with the master and operates single mode; (iii) a region of complex dynamics that occurs on only the positive detuning unlocking boundary. In this region, as the master power increases, we observed single and double excitable pulses, random switching between a locked state and complex multipulse transient, random switching between locked and unlocked states, and random switching between two locked states. Clearly, there is a plethora of interesting physics at work in this third region. In order to better understand it, we have modelled the system using quantum dot rate equations, further details of which can be found in . Our theoretical analysis shows a clear and simple, bifurcation scenario, which enables the observation of single and double excitable pulses. Fig. 4: Optical spectra of the free-running (black) and injection locked QD-MLL with 17% absorber section for a number of master wavelengths (shown with arrow). Fig. 5: RF signals of the slave laser with 12% absorbance section for the free-running case (black) and with dual injection (red). One of the major drawbacks with semiconductor passively mode-locked lasers is that they often exhibit worse timing jitter than their larger, actively mode-locked counterparts. Timing jitter is the variation in the time between pulses, and can be particularly detrimental in clock signal and communications applications. MLLs based on quantum dots (QDs) are expected to exhibit lower timing jitter and more robust operating regimes compared with quantum well devices as a result of the reduced amplified spontaneous emission in three-dimensional quantum confinement and a lower line-width enhancement factor with respect to less confined structures. The high repetition rates of MLLs, means it is difficult to measure the timing jitter with an electrical spectrum analyser, and instead we use a time-domain optical cross-correlation technique . We have demonstrated a record combination of 2 ps pulses and 25 fs/cycle timing jitter (500 fs, 1-100 MHz), with 1 mW average output power per facet . We have also investigated dual-mode injection of QD-MLLs, using frequency resolved Mach- Zehnder gating (FRMZG) to characterise the pulse intensity, phase and chirp. FRMZG is a linear technique based on the same principle as FREAG, except using a Mach-Zehnder modulator as the gate. Dual-mode injection close to a pair of slave laser modes resulted in significant narrowing of the optical spectrum and tunability of the slave laser spectrum, with low timing jitter and significantly improved pulse time-bandwidth product (TBP) . Figs. 4 and 5 show how the slave output spectral shape was remarkably consistent at the different injection wavelengths, with very little laser power at wavelengths below the injection wavelength and the peak output approximately 1.5 nm longer than the injection.